The very embodiment of beauty and power!!!! thank you for your title and story with the location. i feel this is the correct way to submit photos, well done!! Truly amazing photograph. Many congratulations. Usually I shoot at sunrise. This time we had to wait for the sun, so it was much later, but the light was still nice. Even if the photo wasn't taken at sunrise the light conditions were perfect for this shoot. Both horses and mountains were very well lit and the light wasn't still too strong. I love to take photographs in Bieszczady Mountains. 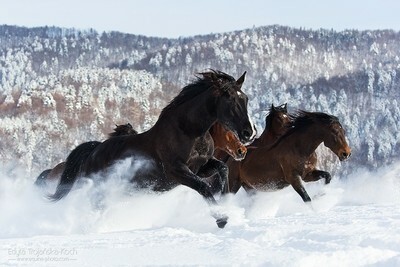 They are still wild and give many opportunities to photograph horses on an amazing background without any traces of civilization. I try to process my photos as little as possible. That's why I pay a lot of attention to chose the right place and theright time of the day to get a perfect shoot. The sunrise and sunset light is the most beautiful time of the day, but there are places where it's not the best time to take photos. It's important to always check the light conditions in the place we want to shoot, before the shooting so you could choose the best time for this particular place. To take similar picture you will probably need some help to make horses cross exactly the point where you want them to be.